To uninstall apps on Mac, you might need to do a bit more than just drag the icons to the Trash. While many apps leave leftovers behind, it’s important to find the way to remove every trace. Here’s an ultimate guide on how to uninstall apps on Mac – completely and irreversibly. If you're anything like us, you install loads of apps on your Mac, always trying to find the best tool for the job and keen to try out new ones. That, inevitably, means you have a hard drive or SSD full of applications you never use and which are sitting there taking up disk space. Your Mac’s performance directly depends on how well you can run cleanups, freeing up valuable storage. In case you’ve recently switched from Windows, we recommend you forget every app removal strategy you’ve used before. With Mac, it’s all different. And lucky for you – much easier. To install and anchor a program in Windows, you have to use a native installation service. The same should be used to remove an app. If you simply remove the app folder, you’ll leave behind all the entries and files associated with the app in question. Because a user might not know where these files are stored, it’s impossible to remove apps without Windows Installer. Uninstalling apps on Mac entails fewer security risks. Plus, you can choose your own way to completely delete apps. When you install an app on Mac, the program itself will be stored separately from configurations – in /Applications. Therefore, you can easily access every app and associated system files, as well as delete the whole program folder from there. In case there are any leftovers, you can clean them away separately or use automated solutions. The most popular misconception about removing apps on Mac is that it's enough to move the app icon into the Trash bin. For images, videos, and files that is enough but that is not the case with apps. 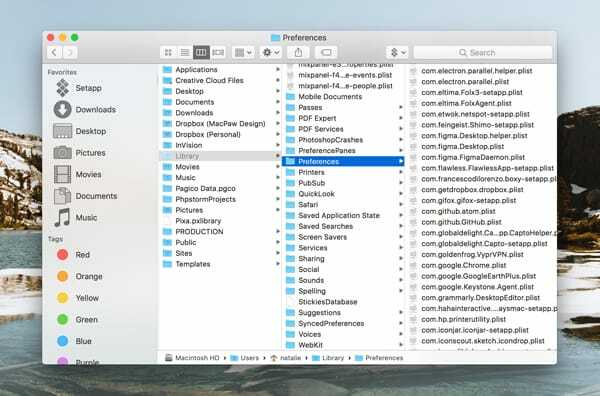 Applications store lots of files in various places on your Mac, things like storing preferences and user data. To remove an app completely, you need to remove all of those files too. 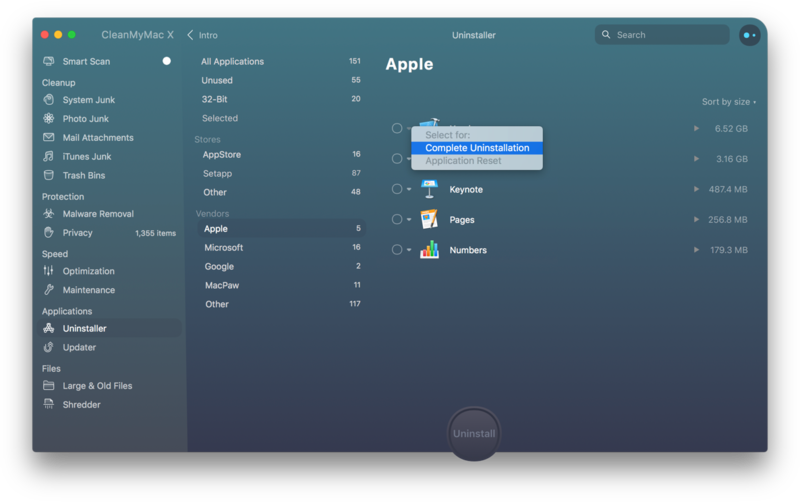 There are three common ways to get rid of apps on Mac: manually, with Apple’s native uninstaller, or using third-party software. Open Launchpad (press F4 or click on the rocket icon in Dock). Find the app by typing its name. Press Option and confirm you want to delete the app. Open Finder (click the first icon on the left in your Dock). Locate the program you want to remove and move it to the trash bin. Empty the Trash or remove a specific app from the trash bin (locate > right-click on the app > Delete Immediately). Whichever of these two methods you use, neither helps you to get rid of logs and associated system files. Drag the app icon or folder to the Trash bin. Locate associated files and preferences: Open Finder and click on Go > Go To Folder > type '~/Library' > Go. Go to Preferences and drag any files with the same name as your application to the Trash. Access Application Support folder and do the same. From your user Library, access the Go menu again and choose Computer. Click on your startup drive in the window that opens and then select Library. Repeat the steps above – search Preferences and Application support for files with the name of the app and delete them. Repeat for every app you want to delete. Once you've deleted one app like that, you can go through the same process again for every app you no longer want on your Mac. Manual cleanup is not a safe (or easy) procedure to perform, so you might want to opt for a ready app uninstaller. Using an app that will do all the hard work for you, you can save lots of time and effort. For instance, CleanMyMac X will scan your Mac for all the files associated with any app you choose and delete them all at the press of a button. You can use it for 7-day free with a Setapp account. Open Setapp and run CleanMyMac X. 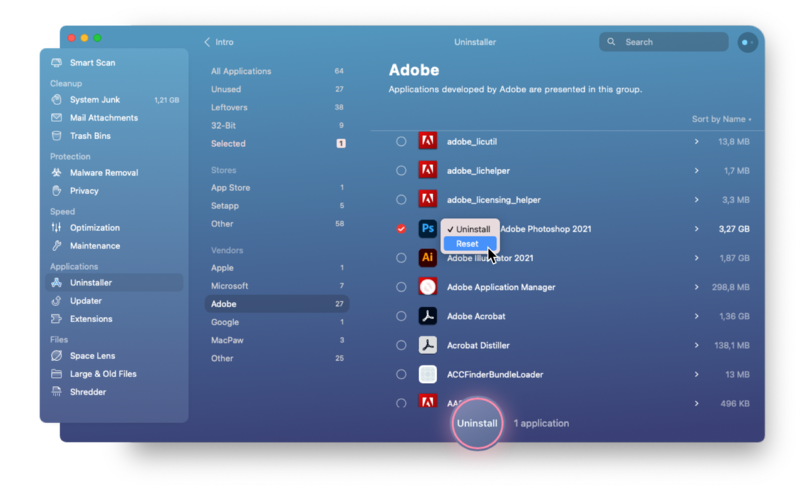 Look on the side bar for the Application section and click Uninstaller – you'll see the window fill up with all the apps on your Mac. Locate the app you want to remove and click on the box next to its name. You'll see all the files associated with the app listed in the window. Click Uninstall at the bottom of the window to remove the whole program. 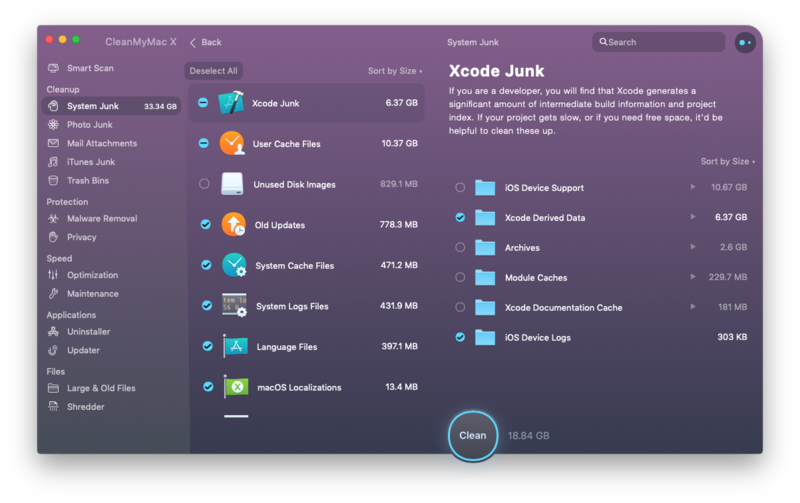 You can remove multiple apps at once, including corresponding files and preferences. Now you know how it works, you can click on the checkbox next to every app you want to remove and when you're done, click Uninstall. They'll all be removed at once. 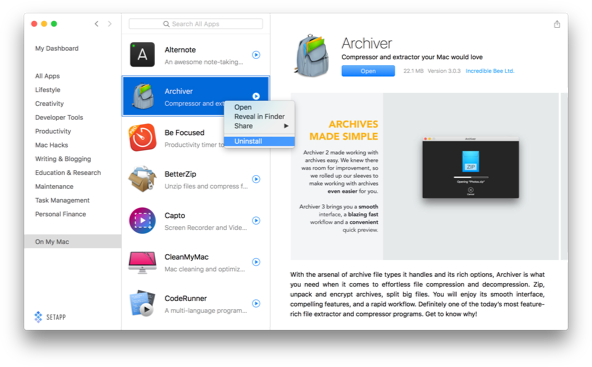 There are quite a few apps that brutally abuse your drive space with cache files. Xcode, Sketch, Final Cut, Photoshop, modeling and architecture software, you name it. For instance, Xcode generates junk even when you don't use it. To see if one of your apps is being greedy space-wise, you can use CleanMyMac X System Junk module. Open the app and run a System Junk scan. Then go to Review Results and you'll see apps with overgrown cache files ready for cleanup. Select them, click Clean and have one less problem on your Mac. There are a couple of reasons to reset apps rather than delete: the app is buggy and crashes but you still need it or the app is a system utility. System utilities are impossible to delete but it doesn't mean they can't cause trouble and misbehave. In this case, you can reset them. There is a reset option in CleanMyMac X. Go to the Uninstaller tab, choose the app in question, tap the right-click and choose Application reset. This will remove all the additional files associated with the app and just leave the main file in your Applications folder. That will reset the app back to the state it was in when you first downloaded it. Application reset also helps with apps that have started to accumulate too many resources. You can check on that using iStat Menus app. But keep in mind that all app data gets purged in a reset so you'll lose preferences and usage history if it was stored on your Mac. In case you encounter an app that acts like malware/bloatware or simply refuses to be deleted in an ordinary fashion, there's also a way to get rid of it with CleanMyMac X.
Malware and bloatware are different. While malware is deliberately harmful, bloatware is simply unnecessarily large, occupies RAM and space, and thus overloads your Mac. You can detect bloatware with iStat Menus. When you install it and let it monitor your Mac for a while to see RAM cycles and processor load, you'll be able to view exact apps and processes that seem to put pressure on your Mac. These apps might be bloatware-like. Use the Uninstaller in CleanMyMac to remove them if you believe it's necessary. “Can’t be modified or deleted because it’s required by macOS” – that’s what your Mac will tell you if you try to delete a default app like Mail or Safari. It means there’s no recipe on how to uninstall programs on Mac in case these come as an integral part of your OS. Open Setapp and go to the On My Mac tab. Find the app you would like to delete and control-click it. It's actually pretty easy with the right tools. The are two options, depending on whether your apps come from Setapp or not. If your apps come from Setapp collection. This is definitely the easiest possible option, you simply open Setapp, find an app you've removed and install it again. If you need to restore an app from elsewhere. You can re-download it from the vendor website or the Mac App Store if you found it there. In case that's hard or impossible for some reason, you can recreate the app on your drive. Disk Drill is an app that can look into your drive, find the memory bit where the app used to be and, if you haven't done too many actions since you've deleted the app, restore it in full. It's also on Setapp collection by the way, and it's pretty easy to use. Simply open Disk Drill, search for the app you've deleted, and click Recover. That's about it concerning how to uninstall software on Mac and the tools you might need for that. We hope this guide has been of use to you. Have a nice day, cheers.